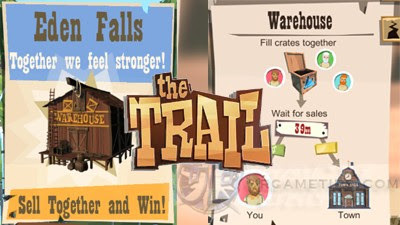 Here's a quick overview on how the Warehouse works in the Andriod and iOS mobile game - The Trail. The Warehouse is unlocked by default, and it's the only way to grab some free Gold in the game. 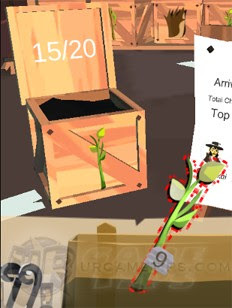 Add items to crates with other townsfolk to earn Chits. The town that earns the most will win special prizes. - The item needed is also the featured item on the crate. If there is no featured item, place any item that you think your neighbors can easily produce too. Fill up the crate to 20/20 to reset the featured item again. - You may only add items that has red dotted lines, if it doesn't appear, just wait or reset game. - Your town can only fill one crate at a time. - Each Crate filled = 1 Gold (currently 13 crates max per day, can be seen on the background). - Gold is used to purchase Town upgrades. - If your Town prefers to gain fast Gold, just place cheap and easy to gather items like: Sticks, Stones, Fur, and more. Avoid placing uncommon or rare items, including hard to craft items. - Hoard at least 25 pieces per item (yes, more than 20 because sometimes, the crate wouldn't count an item). Still gather unneeded items along the trail, and place them inside your Private Chests until you get at least 25 pieces, then place them all in those crates. - If unlocked, your Town's Community Logging area is also a great way to fill up the crates fast. - Depending on the value of contributions made by players, the trader who comes to your town every 24 hours will also give a handful of Chits. - The overall Chits gained depends on the quality and value of all the items placed, so high value Items = more Chits. - Example: Hats (Native Headbands or Pilgrim Hats), Wooden Carvings and Toys. - Chits gained is around x2 of the original value of the item (resetart game if you didn't get your share). - This is also a nice alternative if you are getting errors from the "Watch Video for 2x Chits" option. - Add items to crates with other townsfolk. The town that earns the most will win special prizes (rival towns will be randomly generated). - Rankings are based on the total Chits gained from sold items, so it is best to focus more on Hats (Native Headbands or Pilgrim Hats), Wooden Carvings and Toys if your town wants to win the weekly assessment. - Winning first place will grant your town extra prizes like Gold or a random town buff that benefits everyone.